Mr. 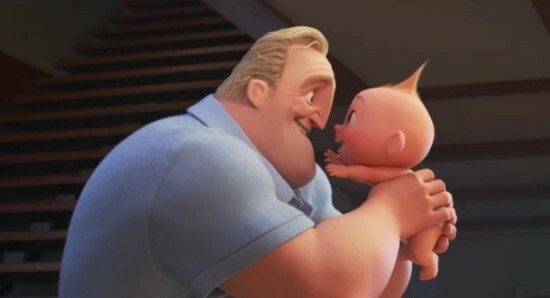 Incredible holding baby Jack Jack in the "Incredibles 2" trailer. Image source. Anyway this article is about the "estimated 160,000 tons of packaging waste" produced as a result of all these items being shipped. Let me tell you: It is MIND-BLOWINGLY convenient to buy stuff online in China. It is ABSURDLY convenient and cheap. I live in Shanghai and typically when I order stuff online it arrives within 1 or 2 days, and it's often cheaper than buying stuff at a store. It is also RIDICULOUSLY convenient to order food through an app and have it delivered. I do this EVERY DAY because I don't want to spend a ton of time cooking or going out somewhere to get food. I cannot emphasize enough how cheap and convenient China's delivery system is- especially in big cities. Tons and tons of stuff packaged up in disposable packaging and delivered to people individually. There's so much of it because it's just so damn convenient and cheap. So yeah, I can definitely see that this would create a huge problem with the amount of waste it produces. 2. The Sorting Hat's BIG Secret | Harry Potter Theory (posted November 16) "I'm sorry but I feel like the logic there is a little flawed. But so is the [Fidelius] charm altogether, a little bit. Like, what are the limitations of this thing? Can you just hide any information inside of someone? Like for example, how to use a doorknob. Could I just, like, hide the knowledge and information about how to do that inside of somebody? And then even though lots of people used to know how to open doors, we'll now all be stuck behind doors. Unless that one person tells everyone." And here's the next one: Perfect Number Watches VeggieTales "Dave & the Giant Pickle"
4. On public mourning when Evangelical culture kept you in the dark (posted 2016) "When the rest of the culture engages in these displays of public mourning for departed pop stars, I feel like I’m left here mourning the childhood evangelicalism stole from me." Clearing the Temple Was Not a "Peaceful Protest"